Good Morning! Happy Tuesday everyone. The newest sketch is up at Tuesday Morning Sketches and we have Deedee's Digis sponsoring us! Yay! 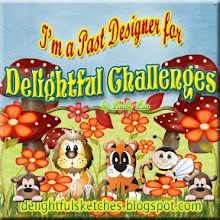 My card features colored digi and digi paper from the Party Animals set. Get your sunglasses, because this card is bright and fun! And anyone who knows me, know I don't do bright colors. We just don't get along. But I didn't have get along, I just had to play nice while the digi set just did it's job. 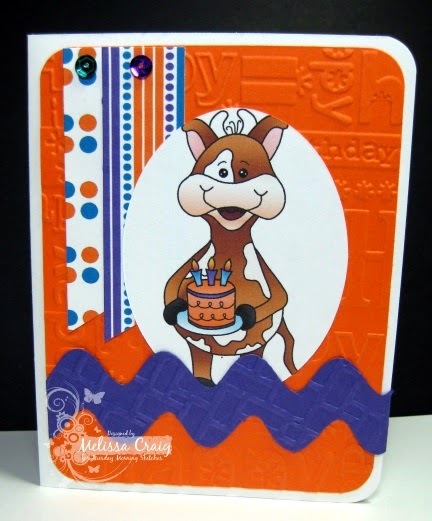 I added orange and purple card stock, a little embossing and voila - a happy birthday card for any child at any age. I do hope you'll join us at TMS for another fun challenge. Hello! Thank you for coming to my little corner of blog-land. 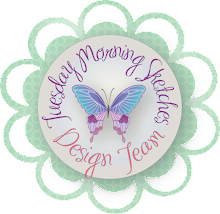 The sketch is up at Tuesday Morning Sketches and our sponsor is DRS Designs. I had this idea and at first my idea was a bit bigger. But as the evening wore on, and I'm running out of time.... my daughter using my computer... my son in the kitchen making tzatziki sauce for school tomorrow, my idea shrunk a little. I was thinking huge daisy and had to settle on little posies. 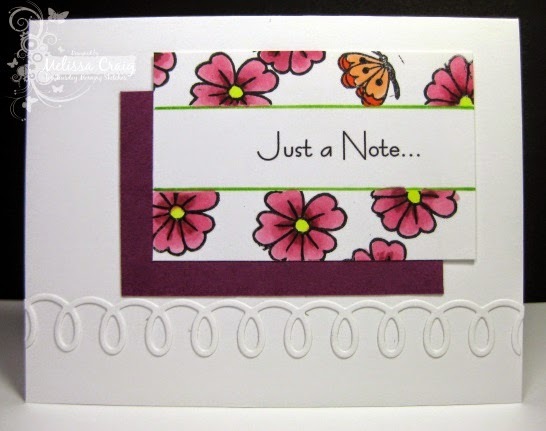 The original stamp is a cluster of 3 flowers with a butterfly hovering over to the left. Well, I cut off the highest flower and the butterfly to use as separate stamps. But no worries, when I want to use my stamp as it was made, I just mount the pieces on the block in the right spot and voila - frankenstamp! I kept it clean and simple and embellished it with the swirly die cut border (MFT Stamps) that reminds me of the icing on a Hostess cupcake. Thank you for stopping by and I hope to see you at TMS. Have a great day! Good Morning! I am so excited to announce that I am on the Digi Playground Creative Team. I feel so blessed that they have allowed me to be on this team. And honestly, my first go-around I feel like I've done a face plant. I had so many ideas and every one of they went bleh in my hands. Do you ever feel that way, that you're just wanting to create and create and yet everything you touch goes way south from what you pictured in your head? I have good news for you. Sometimes you don't have to think about it! The artists at Digi Playground have taken all the guess work out. 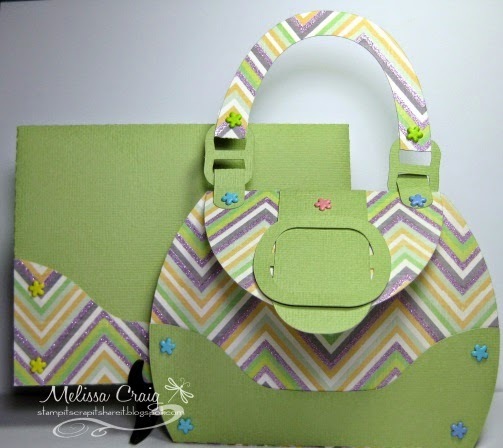 Like with this adorable purse card/envelope combo you can find here in March Kit of the Month by Samantha Walker. The hardest part of this project was picking out the paper to use. This could be done in so many ways. 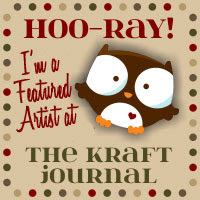 I chose paper from The Delightful Stack by DCWV and pastel card stock from American Crafts. I've had these little flower brads in my stash forever now. I was able to put this together in no time and then when I was done... well ideas started flying. That piece on the front the purse could be cut a second time, adhered on the inside to create a pocket for a gift card! Thank you so much for stopping by and have a great day! Good Morning! Well, officially the month of birthdays ended yesterday. Hollyanne is 17 and I am just awed by this wonderful young woman she has become. She's beautiful, she's talented, she's a fiercely loyal friend and despite her diva-like moments, she's very kind-hearted. But thank goodness, no more birthdays until June. Anyway, the latest sketch is up at Tuesday Morning Sketches and we have veteran sponsor, Bugaboo Stamps with us this week. My card features Make it Snappy - Thanks a Bunch. I have always admired cards created with a spotlight technique. There's probably tons of ways to create a spotlight, but I really like this one. I sized the image so that I can make it into a 4 x 5 1/4 mat and then printed it off a second time to create the spotlight. I did use an oval cut smaller than I wanted but it was it was and I just had to deal with it. I die cut the rick-rack trim from a die by MFT Stamps and then embossed with the basket weave embossing folder from Stampin' Up! The sentiment is cut using my Silhouette Cameo. 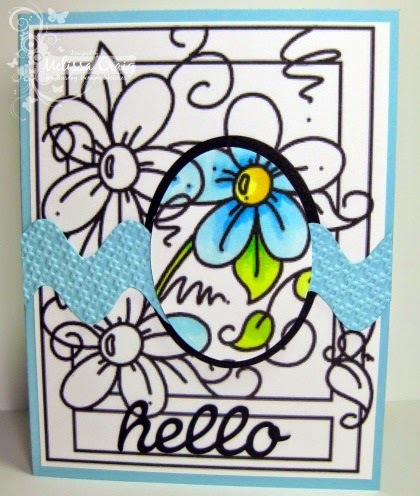 Pretty easy card - cool punch of color. Thank you for stopping by and please head over to TMS to play along! Autism isn't something that personally strikes home, however, I'm here because my friend and TMS design team member Jessi Fogan has two Autistic children. They sound like amazing boys! 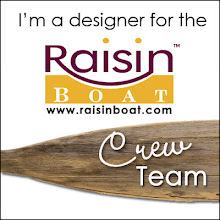 And I want to show my support for her as an amazing mother, talented crafter and sweet friend. I am trying so hard to put my words together to share how I feel when I hear of others having the audacity to be so cruel to those who are autistic. They are people... just people who have to figure out their life just as everyone. We have so many fantastic sponsors that have shown their support for Autism Awareness and you can see the complete list here: Light it Up for Autism main blog post. 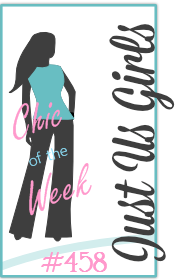 If you would like a chance to win a prize from one of these fabulous companies leave a comment on this blog, and any of the other blogs participating in today's hop! Winners will be chosen at random and will be announced on Monday April 6. Now here is the card I created for today's hop! I created my card using two cut files I found on the Silhouette Online store. 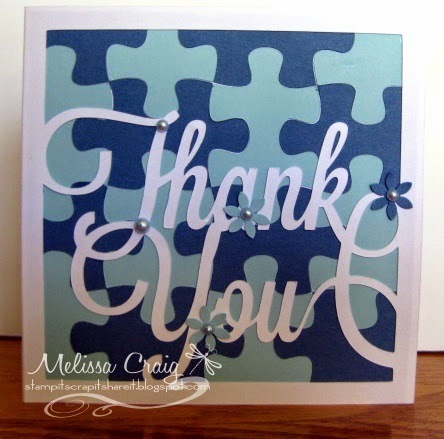 The card base is one whole piece with the sentiment and then I cut a puzzle background out twice in two shades of blue and then glued to the inside of the card front. Then I added a few punched out flowers and finished it off with some pearls. It's a very simple card but I'm pleased with it. Thank you for stopping by today. Have fun hopping!